Around Andrea Bocelli’s family home in Lajatico, in the province of Pisa, Andrea and his brother Alberto, who is more directly involved, are pursuing work to improve the wines and the family tradition. A work done, as Andrea says, in honour of the memory of their father, Alessandro, who in his time passionately cultivated the vines planted by his grandfather in the Tuscan region bordering that of Chianti. The wine, mainly sangiovese red, is called Le Terre di Sandro. The grounds cover a surface area of around 120 hectares, of which a small part is wooded. Cereals are grown in rotation with fodder and, most importantly, the vines as well as olives. In 2000 the brothers planned the development of the wine sector. My brother and I have begun to try to make a serious wine, and the first results are extremely encouraging. We do it in memory of babbo, who had continued the work of my grandparents and who had so much passion. And I like wine, when it’s good. Wine is a universal remedy when we’re tired, and full of problems to solve. I call them bottles of happiness. When I return home from my long work trips away, a bottle of wine from my land, placed there, in the centre of the table, gives almost unparalleled joy. It takes me back in time, brings back the memory of my father, his strong, calm voice, praising the fruit of his vineyard and his work, savouring that nectar with almost religious respect and fervour. What I would pay for him to be able to appreciate the results achieved over these past few years. I’m certain he would be immensely proud. I will always find peace and serenity mongst the rows of vines, at that table where I drank our wine in the company of my father so many times, with Alberto, my brother, my mother and all those dear to me. 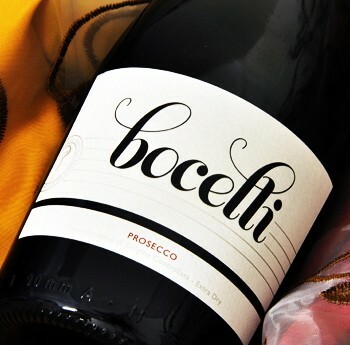 Bocelli Family Wines has expanded their production to introduce Bocelli Prosecco and Bocelli Sangiovese to the US where it’s now available in states like New York, Texas, Illinois, Washington and Oregon. Bottles sell for around $20. Bocelli is not the first celebrity to put his name on a wine bottle. Others who have entered the winemaking business include Drew Barrymore, Antonio Banderas, Francis Ford Coppola, and even AC/DC. Brad Pitt and Angelina Jolie’s home in the South of France, Chateau Miraval, also comes with a winery that produces white, red and rosé wines! I can’t wait to try them all. He is an excellent singer and I know his wine will sing also.. I love wine from Tuscano and this just tops the cake.. Thanks Andrea and your Brother Roberto.. I have been to italy and just love it there thanks for a great experience there all the times I have been.